This recipe is from the great Antonin Carême, the Frenchman who started as street urchin on the streets of Paris and became a cook for kings, czars and other great persons. More information on Carême is on the page with the recipe for soufflé. 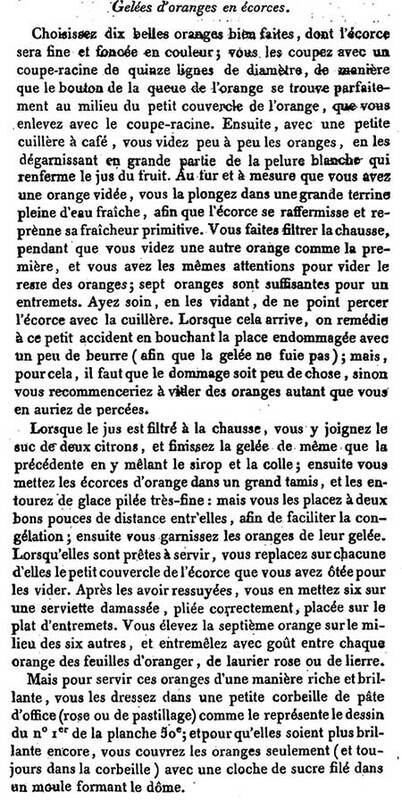 And like the soufflé, this recipe for stuffed oranges is from the Patissier royal Parisien or the Royal Parisian Pastry Cook. The cookery book had very nearly been titled Patissier imperial. Carême’s introductory letter to his teacher Boucher is dated 1 February 1815. France has been a monarchy again for barely a year: emperor Napoleon had been banished to the Isle of Elba after his defeat in 1814. The brother of Louis XVI, who was beheaded during the French Revolution, became king Louis XVIII. 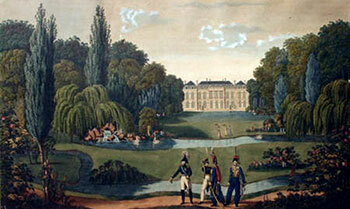 But Napoleon escaped from Elba on 26 February 1815 and marched on Paris. His final defeat was at the Battle of Waterloo on 18 June of the same year. The monarchy was reinstated on 8 July, and the Patissier remained Royal. 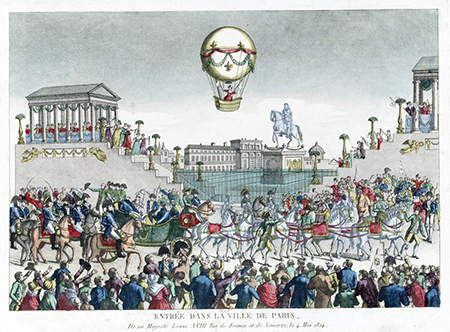 On the pictre is the arrival of king Louis XVIII in Paris on 3 May 1814. The hot air balloon was a spectacle that attracted a lot of attention. The recipe for stuffed oranges comes from the chapter on sweet entremets. In the menu they are served after the roast, but before the actual dessert. Carême describes all kinds of menus in another book of his, Le maître de l’hotel français, such as the wedding of ‘une princesse étrangère’ in the Elysée Bourbon (nowadays the presidential residence of France). This was a special meal: the guests were divided over seven chambres containing 25 tables in all. Each table had a different menu. All menus started with two soups or potages (these are only mentioned with the first menu of a room, but I assume that all tables were served these soups), two entrées (first courses), two entremets, and the dessert in conclusion, consisting of five dishes. The entremets of each table consisted of a vegetable dish and a sweet dish. The second table in the first is served with the stuffed oranges and small turnips ‘à la Chartres’, preceded by Queen’s Soup, vegetable soup and the entrees chicken chaudfroid and blanquête de riz de veau in rice. The dessert consisted of five dishes, but Carême does not specify which dishes. And during a large ball on 6 January 1811 Carême served a buffet for three hundred guests, with, amongst other dishes, forty entremets. The stuffed oranges were present, but also ‘Provencal Cauliflower’ and ‘Salsifis Salad’. More on Carême and the organization of large feasts (three hundred guests were nothing!) 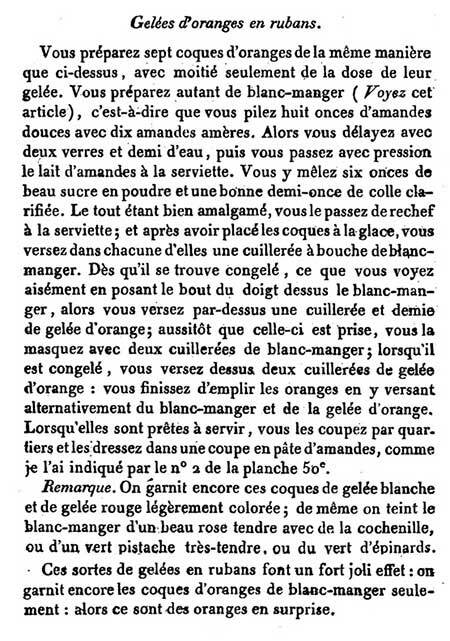 can be read in the recipe for Potage d’orge perlé à la française. Carême uses isinglass to make his jellies firm. Isinglass has a ‘fishy’ origin. In its purest form it consists of clear, colourless leaves which are made from the dried swim bladders of sturgeon or other fish. Isinglass is also available as strips or in powdered form. Good isinglass has no fish-smell or -taste at all, but it is expensive. According to Carême any ‘fishy’ isinglass is bad quality. In my adaptation of the recipe I have used gelatin instead of isinglass. Vegetarians could still use isinglass, or agar-agar which is also suitable for vegans. There is a great difference in preparing isinglass and gelatin: isinglass must be boiled, gelatin must never be boiled. From the Patissier royal Parisien, 1815, vol.2, pp.93-96 (see bibliography). It is rather a lot of text. My slightly abbreviated (and sometimes free) translation can be read below. If you want to see the original French recipes, just click on the links. Choose ten nice oranges with a good and deep colour. Cut a hole with a ‘corer’ with a diameter of 3 centimeters, in such a way that the apex of the orange is exactly in the centre. Empty the orange with a coffee spoon. Submerge the emptied oranges at once in cold water, to firm up the skin and keep it fresh. Take care not to perforate the skin with the spoon. If this should happen, repair the damaged spot with some butter (to keep the jelly from running out). But that is only possible if the damage is small. Otherwise, empty new oranges, as much as were damaged. When the juice has been filtered through a stocking, add the juice of two lemons, and syrup and isinglass. Then put the oranges in a large colander, and surround them with crushed ice. Keep two thumbs distance between the oranges to make the jelly set sooner. Then fill the oranges with the jelly. 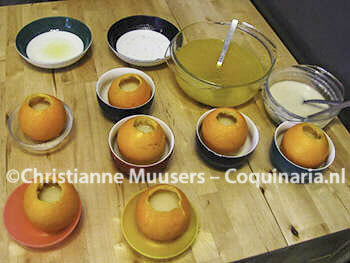 Before serving, replace the covers on the oranges. Wipe the oranges and place six of them on a beautifully pleated damask napkin, and the seventh slightly higher in the centre. Decorate with orange leaves, oleander or ivy. For a splendid way of serving the oranges are placed in a basket of confectionery, and to make it even more decorative, place a cloche of spun sugar over it. Prepare seven oranges as described above, but with half the amount of jelly. Also prepare the same amount of blancmange: pound eight ounces sweet almonds with ten bitter almonds. Temper with two-and-a-half glass of water, then squeeze the almond milk out through a cloth. Mix six ounces good powdered sugar with half an ounce of clarified isinglass. Mix well, and strain it once more through a cloth. Put the oranges on ice [as described above] and pour a tablespoon of blancmange in each orange. As soon as it has set, which you can check by pressing on it with a finger tip, pour one and a half tablespoon orange jelly over it. As soon as that has set, pour two tablespoons of blancmange over it. When that has set, pour two tablespoons of orange jelly over it. Finish with pouring in alternate layers of blancmange and orange jelly. When they are to be served, cut them into quarters, and arrange them on a layer of marzipan. This kind of layered jelly offers a very decorative effect. Some fill the oranges with just blancmange, then they are called ‘oranges en surprise’. Carême’s recipes are clear enough. Still, I hope my version is slightly more structured. I have left out the building of a marzipan pedestal, but please try it if you like. For 28 to 42 slices of stuffed orange; preparation in advance 20 minutes; preparation 20 minutes + plus stuffing the oranges and waiting for the jelly to set. Make a small hole (about 3 cm/1.2 inch) in the top of the orange, around the apex. Scoop out every orange through this hole, reserve juice and fruit pulp. Submerge the emptied oranges at once in cold water. Orange jelly – Press the pulp as much as possible, and strain all the collected orange juice with the lemon juice through a cloth. The juice must be as clear as possible. Take half of the juice. I had 1.7 litre (3 UK pints) juice from seven oranges and two lemons, half of that is 8.5 decilitres or 1.5 UK pints. Prepare the same amount of sugar syrup with 4.25 decilitre (0.75 UK pint) water and 425 gram sugar. Bring to the boil and stir until the sugar has dissolved. Measure how much liquid you have in all (fruit juice and sugar syrup, but not yet combined). Take 3 gelatine leaves for every 2.5 decilitres of liquid. Steep them for ten minutes in cold water, squeeze them and add them one by one to the hot sugar syrup. As soon as the gelatine has dissolved, add the sugar syrup to the fruit juice that is not itself heated. Set aside until further use. Blancmange jelly – Pour boiling water over the almond flour and ground bitter almonds and let this stand for fifteen minutes. If you use essence of bitter almonds, that is added later. Strain the almond milk, squeezing the ground almonds well to obtain as much milk as possible. Measure how much almond milk you’ve got. Steep the gelatine leaves in cold water for ten minutes (use 3 leaves for every 2.5 decilitres or 1 cup liquid). Bring the almond milk to the boil and add sugar and almond essence if you use that. Squeeze the gelatine leaves and sissolve them in the hot almond milk. Set this blancmange also aside until further use. Composition – Take the emptied oranges out of the water and let them drain, preferably in the refrigerator. Then place them with the opening on top on a large dish or in individual bowls. Pour in each orange one tablespoon blancmange which has not yet set. Put the oranges in the refrigerator for fifteen minutes, take them out and pour some orange jelly in the oranges. Reheat the jelly a little to make it pourable again. Then back in the refrigerator, and so on, until the oranges are filled up. If you have leftover orange jelly or blancmange, you can let it set and cut into cubes as garnish. Refrigerate the stuffed oranges until the moment of serving. Cut the oranges with a very sharp knife, or an electrical knife into four or six parts. Arrange on a decorative dish. If scooping out the oranges through a small hole seems too much work, just squeeze them and serve the layered jelly in glasses. Antonin Carême, Le Patissier Royal Parisien ou Traité Elementaire et Pratique de la Patisserie Ancienne et Moderne, 1815. 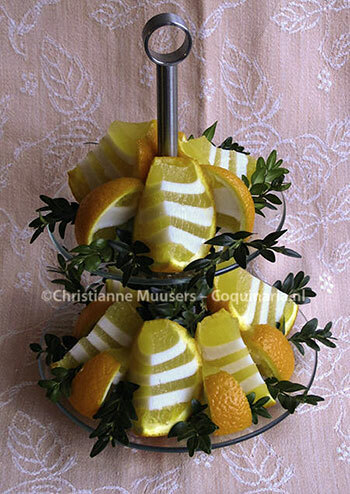 This is a festive way to present oranges. A recipe from 19th century celebrity-chef Antonin Carême. Previous Post: « Soup with Sauerkraut? Delicious!